James Cohan Gallery is pleased to present our second solo exhibition by Japanese-born, London-based artist Hiraki Sawa. 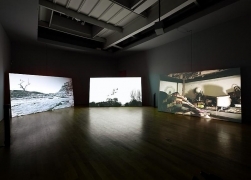 The centerpiece of this exhibition is a video and sound installation entitled O (2009), originally commissioned by the Queensland Art Gallery for The 6th Asia Pacific Triennial of Contemporary Art in Brisbane, Australia. 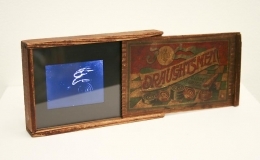 Presented across a triptych of large-scale projections, ten small video monitors and five channels of audio, O abstracts the notion of time by the simultaneous depiction of interior and exterior spaces, meditations on the moon and the earth, and suggestions of the present and distant exhibitions. The installation transports the viewer into a dreamlike state in which he or she is enveloped in an immersive world of sound and image. Ten small monitors show black and white video of ordinary objects - such as a bell or a cup - spinning endlessly. Three large projections show a selection of black and white images from Australia’s desert landscape surrounding the town of Alice Springs; an unspecified ocean view that melts into footage of a flock of birds flying across the desert sky, and color shots that linger of the interior of an abandoned house in the south of France brought to life with Sawa’s recurring and signature animations: a ferris wheel, flying birds, a tree with fluttering leaves and a rising moon. The audio component, created by the group Organ Octet and edited by Dale Berning, is presented on custom-built speakers that spin intermittently, sending the clatter and rolling sounds of spinning objects and the airy tones of miniature organs around the space. Also on view will be a new single channel video work, in which Sawa explores the phenomenon of amnesia and the devastation of severe memory loss through a series of abstract visual sequences. This work is a study for a longer, more narrative film project that has been commissioned by the London-based organization, Animate Projects and producer Jacqui Davies. In addition, Sawa will present a suite of delicate pencil drawings, which illustrate the phases of the moon. 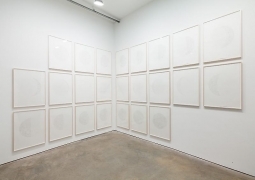 Each drawing starts out as a meticulous rendering of the lunar surface which Sawa then erases, in some cases nearly completely, to show how the moon appears to us as it waxes and wanes. Hiraki Sawa is exhibitionsly participating in The Dissolve at SITE Santa Fe Eighth International Biennale (June 20, 2010 – January 2, 2011), and in March of 2011 his work will be included in an exhibition of works by Japanese contemporary artists titled Bye Bye Kitty! at the Japan Society, New York. His work has been included in major international exhibitions such as 17th Biennale of Sydney, Sydney, Australia (2010) and the Sea Art Festival, Busan Biennale, South Korea (2008). 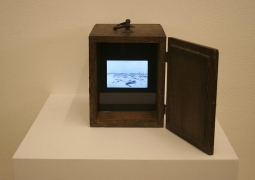 Sawa’s recent solo exhibitions include Carrousel, Musée des Beaux-Arts et d'Archéologie and the Musée du Temps in Besançon, France (2010); Hiraki Sawa, Colby College Museum of Art, Waterville, ME (2008); and Hako, Chisenhale Gallery, London, UK (2007). His works are included in important museum collections such as UCLA Hammer Museum of Art, Los Angeles, CA; the Modern Art Museum of Fort Worth, TX; the Detroit Institute of Art, MI; The Israel Museum, Jerusalem; Museo de Arte Contemporaneo de Castilla y Leon, Spain; and the Museum of Contemporary Art, San Diego, CA. He lives and works in London, United Kingdom. For further information, please contact Jane Cohan. To view selected works and read press articles, please visit the artist’s page at James Cohan Gallery .